Our admission mornings offer you a tour of our campus so that you can see inside for yourself. The group format allows you to hear from other families who are investigating GA...they may have questions you had not considered! Our Admission Morning (am@GA) events run from 9-10:30am. We invite students to stay and visit classrooms after attending our Admission Morning (am@GA) events. "A Day in the Life" provides students the opportunity to see if GA feels like the school for them. In order to plan for this Admission event, you must call 267-405-7070 at least one week prior to the event so that we may plan for your visit. 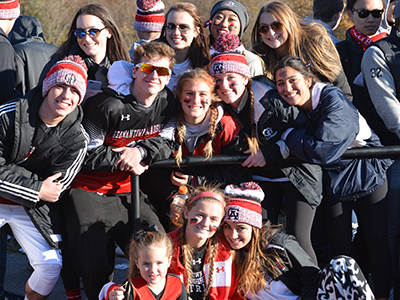 Germantown Academy’s approach to athletics is rooted in our school’s mission. We seek to inspire our student-athletes to be confident, collaborative, and honorable in their pursuit of sportsmanship, teamwork, leadership, and lifelong fitness. Join us at any of our sporting events! Whether it's learning printmaking in Kindergarten, creating STEAM projects in 4th Grade, playing cello in the Middle School string ensemble, or singing the showstopper in a Belfry Club stage production, every student can hone their personal voice and mind's eye in our Arts program. For more information on this year's events, please contact us - 267-405-7070. Germantown Academy would like to invite you to attend one of our community events! Guided by our Mission Statement and Strategic Vision, we offer programs that are interesting, informative and inspirational.